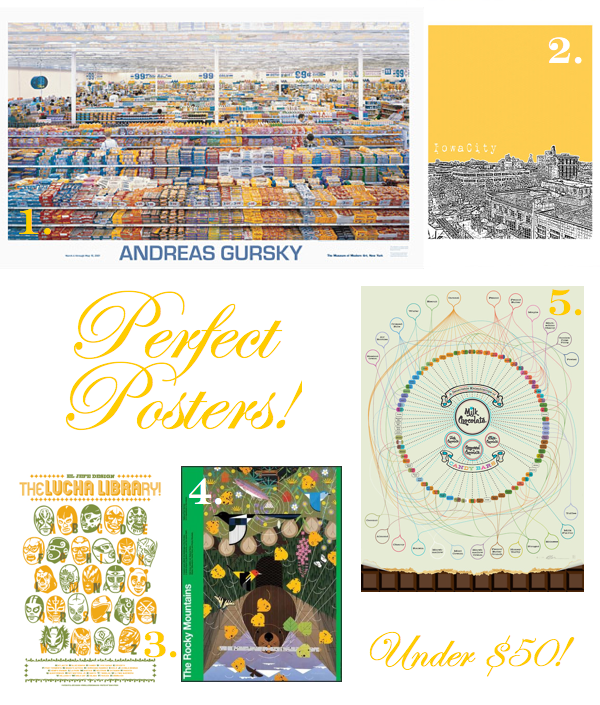 Five Under $50: Perfect Posters! Everyone loves a good poster. Even for those of you with the most expensive and refined tastes, a poster that pops is perfect in a basement, plays space, or child’s room. …and for the rest of you, posters can definitely find a home in your living room or hallway. Framed or not, infographic or homage to pop-culture, there’s a poster for everyone. Below are five of my favorites right now. Forgive me for being heavy on the text…I just love it! I love those Bird Ave skyline images — custom on the cheap! And the Gursky photography is a longtime favorite of mine; every time I see it I want to think it’s a painting and not a photograph. The El Jefe Alphabet was recently installed in a client’s 10 year old son’s bedroom — talk about perfect! Categories Art, Five Under $50!